● CCTV for monitoring the status of the end section. ● Temperature controlled by SCR with P.I.D. settings to have accurate temperature (±2℃). ● Double layer insulation design to prevent the heat from leaking out. 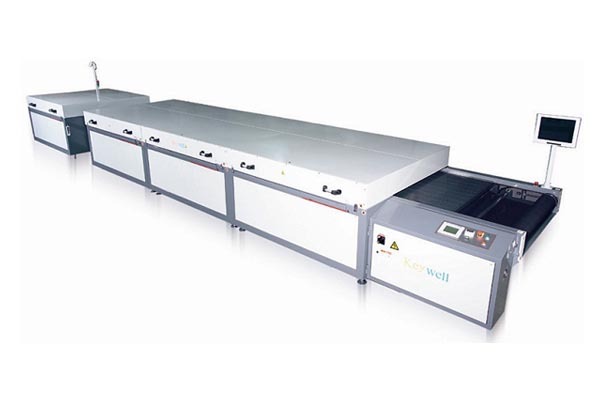 ● Equip with exhauster to have clean air in the working room and dry the substrates quickly. protectors for motors, fuses for controlling circuit. ＊ Custom size is available. Suitable for drying financial card, scratching card, FPC, membrane switch, plastic sheet, sticker … etc. after screen printing.